"Is being repeatedly abused by your health professional just another page in the systemic abuse and cover up of child sexual abuse and childhood trauma that many of us have experienced? Claims of trauma informed and evidence based support or treatment do not guarantee or ensure that your diagnosis or treatment will be based on scientific evidence." psychiatry and psychology both rely on a diagnostic and statistical manual either the DSM, a Diagnostic and Statistical Manual of Mental Disorders or the ICD-10 the International Statistical Classification of Diseases and Related Health Problems. Both of these systems rely upon the unfounded notion of chemical imbalances in the brain for which there is no supporting scientific evidence therefore it is a fallacy far removed from reality when proponents make claims of being evidence based while the history of tens of thousands of recipients of these forms of faith healing, shamanism or a distorted subset of another belief based religious culture cause untold misery for the many millions that are affected. Psychiatry differs from psychology (It must be said at this point that not all GPs, psychiatrists and psychologists adhere to this failed concept.) in that psychiatry does not take into account previous life events thus ignoring the evidence of the root causes of your current condition. This is a form of denial that psychiatry denies having any adverse affects and denies the importance of life events that scientific evidence has repeatedly and consistently shown to be the most important factors in understanding the psychology of every individual on the face of the planet. Psychology on the other hand does take into account life events such as trauma and sexual abuse and then relies on the implausible, unfounded devoid of evidence diagnostic processes of psychiatry to make a formal diagnosis. which is devoid of evidence. This recipe for failure has created one of the most bizarre forms of medicine our world has ever experienced through a combination of enforcement and recognition throughout legal and health systems across the world. When your psychologist or psychiatrist is besotted by such a process you can be assured that your outcomes will be at a minimum as toxic as the process used to diagnose you but will most likely be far far worse as more and more layers of sophistry and unfounded pseudo medicine are added to an already traumatic existence that is followed by the application of drugs that affect the brain to the point of murder or suicide for many or a state of chemical castration of normal human brain functions. The staggering ignorance that makes this the predominant form of treatment for childhood trauma and sexual abuse quickly moves these practitioners into the realm of human rights abusers who have failed to keep their oath of first cause no harm. Psychiatry, psychologists and many GPs have a vested interest in getting you onto brain altering chemicals for which the accompanying information clearly states that they do not know how these products work. There is no repeat custom if a client can self mediate with an active and effective product such as cannabis. Organised insanity that conspires to protect and to shelter the abuser. Candidates must be trauma informed, trauma aware and evidence based. Verbal bullying is a means of using words in a negative way such as insults, teasing, put downs, etc., to gain power over someone else's life. Learn about the Effects of Verbal Bullying! Many people's lives have been destroyed by verbal abuse in business and professional settings. Survivors of childhood abuse are particularly prone to bullying of this variety. One of the most tragic experiences is to encounter this in medical or mental health services. The most often complained of by survivors is when your 'professional' support group convenor uses the information that they have of your experience or condition to "sway" you into a particular course of action. 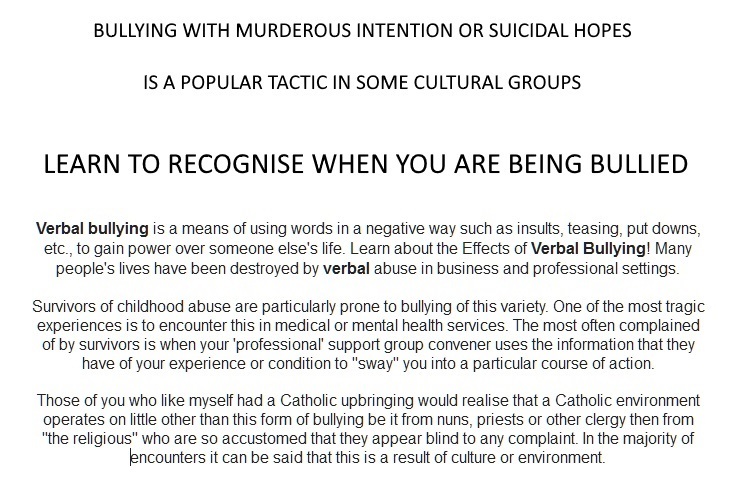 Those of you who like myself had a Catholic upbringing would realise that a Catholic environment operates on little other than this form of bullying be it from nuns, priests or other clergy then from "the religious" who are so accustomed that they appear blind to any complaint. In the majority of encounters it can be said that this is a result of culture or environment.